How Much Can You Make in a Journalism Career? What Courses Can be Taken for an Online Journalism Degree? Journalism has changed immensely in the last decade. Today, most journalism takes place online through digital news outlets, blogs, and social media platforms. 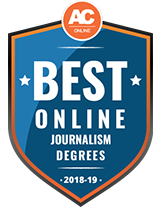 Earning an online journalism degree can help you kickstart your career in this diverse, exciting field. In an online program, you’ll build a strong foundation in verbal and written communication, gain a better understanding of rhetoric and rhetorical methods, and learn how to use social media and digital platforms. This guide will introduce you to the best online journalism degrees available. You’ll learn more about the benefits of earning this degree, the different kinds of careers available to graduates, what you can expect to earn, and even ways to fund your degree. Several individual data points were objectively evaluated to calculate a score for each ranking factor listed above. For affordability, the most impactful data points were tuition2 and grants; for quality, graduation and acceptance rates; for flexibility, part-time enrollment options; and for program, degrees granted in that specific program area. Each score was then weighted, with affordability being the most highly weighted factor for all ACO rankings. 1 Best Vocational Programs included data for both online and campus programs. 2 Both in-state and out-of-state tuition rates were used in our methodology; however, our rankings tool currently only displays in-state rates. A dash in our Rankings Tool indicates IPEDS data was not available. Tuition displayed in in-state and per year unless stated otherwise. When deciding to invest your time and money into earning your bachelor’s in journalism, you’ll want to choose the best program for you, based on several different factors. A strong online bachelor’s degree in journalism offers students a flexible, affordable, quality education. The programs below were ranked based on factors like graduation rates, availability of online courses, and tuition costs. All data comes from the National Center for Education Statistics and the Integrated Postsecondary Education Data System. Students interested in entering careers as reporters and correspondents can pursue an online associate degree in journalism through the Austin Community College District. The program focuses on building skills in reporting, writing, photography and public speaking. Graduates from the online Associate of Arts in Journalism program can continue their studies at a 4-year college or begin their careers in the field in entry-level positions. Students at ACC can apply for financial aid to help pay for this degree. A bachelor’s degree in journalism provides foundational skills that can help you thrive in a variety of careers. Many graduates pursue careers adjacent to journalism, like teaching, and other areas of communication, particularly on digital platforms. The information below outlines a sample of potential careers for journalism majors. These professionals often work in newsrooms, newspaper offices, and radio stations, tasked with reporting the news to the public. The changing digital climate has led many of these reporters to work on digital platforms as well. Broadcast news reporters may also have to travel to report on things happening locally and around the country. Editors work in a variety of settings, editing any content created by an organization. They may proofread and copy edit, as well as rework content to fit the marketing goals and specific needs of an organization. These editors may also work with newspapers and publishing companies to edit their publications. Technical writers employ their writing and editing skills to enhance technical publications, including manuals, journal articles, and how-to guides. They generally hold a degree, as well as some personal experience in a specific technical area, like computer science or web design. Many of these writers work in computer and engineering fields. A degree in journalism provides a great foundation for working in public relations, as these professionals must positively represent a company or organization through verbal and written communication with the public. These specialists maintain and manage an organization’s positive image. They may work alone or as part of a larger team. Your salary potential in any career will vary based on different factors. The credentials you hold, your experience in the field, skill level, industry, and employer all help determine your salary. Geographic location is also a factor, as where you live and work can significantly influence your career. For example, reporters and broadcast journalists working in the District of Columbia, New York, and Alaska report higher mean wages than journalists in states like Idaho and Arkansas. You can learn more about the salaries for these professionals in your state using the list below. Every bachelor’s in journalism program will differ based on which school you attend, and that program’s specific requirements. There are a few types of classes, however, that most journalism students can expect to take, particularly in areas like communication, writing, and digital media. The courses below are just a few examples of classes you might take while earning your journalism bachelor’s degree online; make sure to check your school’s specific courses, electives, and degree requirements. Journalists must have a strong knowledge of the laws, policies, and procedures in ethical reporting. This course, sometimes taught in multiple levels over the course of the program, covers ethical reporting and ethics in journalism. This course explores digital mediums and platforms for journalism. This class may appear in different forms over the course of the program, as many journalism programs emphasize digital media. This course covers photography and video editing as forms of reporting fundamental to any journalists’ skill base. This course may explore both analog and digital forms of visual reporting. Journalism students may take extra courses in composition and rhetoric throughout their program. These courses emphasize writing skills, including grammar, syntax, and rhetorical analysis of written work. This course may include aspects of creative writing to craft narratives in journalism. Students may learn about ethnography and the ethics of human observation, as well as navigating storytelling in ethical, unbiased representations of experiences. 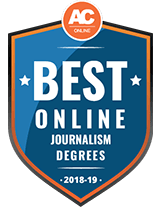 Choosing the best journalism bachelor’s degree online for you may seem a bit daunting or confusing, but with careful consideration, you can easily navigate the process and start your academic journey. The questions and responses below will help you better understand the importance of things like a school’s reputation in the industry, accreditation, tuition costs, and specific degree requirements. What should I look for in regards to a school’s reputation in the field of journalism? Consider whether the program has won any accolades or awards. This includes individual faculty members; what experience has each faculty member had in the field? Where have they worked before, and what projects are they currently working on outside of teaching, if any? Consider whether the department has a reputation in the field and if the curriculum seems progressive and adaptable to the current state of the industry. What accreditation should I look for? Attending an accredited school should be a top priority. Schools generally hold either national or regional accreditation, and the latter is the more prestigious and common certification. Accreditation adds an important weight and significance to your degree, and also allows you to transfer earned credits more easily to other institutions, should you need to. Some journalism programs may also hold programmatic accreditation through agencies like the Accrediting Council on Education in Journalism and Mass Communications. What should I look at when comparing tuition costs? Tuition can vary a great deal from school to school, and even from state to state. Think about your personal budget, and whether or not you plan to receive any financial aid in the form of grants, scholarships, or loans. Remember also that private institutions usually cost more than public schools. The length of your degree will also impact your total tuition costs, and how many credit hours you must earn before you graduate. Consider the cost-per-credit at each school, and calculate an estimation of your total tuition costs based on the required credits to help you compare tuition costs for different programs. Should I look for a program with a specific curriculum? Consider your personal career goals, and what you would like to get out of an online journalism degree. Look for a program with a curriculum that best aligns with these goals. For example, if you want to eventually work specifically with digital and online media, consider evaluating programs that offer concentrations in this area, or that offer a range of courses in those subjects. How will this degree help me reach my goals? A journalism degree underscores your skills in writing, speech, content creation, and digital media. Earning this degree helps you develop the knowledge and experience you’ll need to thrive in a variety of careers, both inside and outside of reporting and broadcast news. Once you choose the right program, figuring out how you’ll fund your education can be stressful. Many students fund their bachelor’s degree through federal aid, including student loans. However, scholarships and grants provide funding that doesn’t need to be repaid. Below, you’ll find a few examples of scholarships and grants available to students in journalism, with information on how to apply and the criteria required for eligibility. ACES offers six scholarships each year to students at colleges and universities who demonstrate a love and passion for language, regardless of their specific major. The amounts range from $1,500 to $3,000. Applicants must demonstrate success in academics and experience in editing, while also providing a 500-word response to a prompt in the entry form. The Association for Women in Sports Media offers a number of scholarships each year. Each scholarship includes a $1,000 prize, as well as placement in an internship with a sports media outlet, and a complimentary one-year membership to the AWSM. Members can waive the scholarship application fee. The organization’s website provides information about other internship opportunities, as well. The Broadcast Education Association offers over $75,000 each year to students pursuing degrees in all broadcast and reporting fields. The Peter B. Orlick Award, for example, awards one student $3,000 for pursuing studies in an electronic media area. Applicants to all available BEA scholarships must provide letters of recommendation, and official transcripts. Applicants for most available awards must be enrolled full-time in their program to be eligible. The Society of American Business Editors and Writers sponsors this scholarship for students studying to become business journalists. The scholarship fund began with a $50,000 contribution to honor David J. Morrow, a member of the SABEW board who died of cancer. Awards vary depending on available funds. The scholarship is open to any student with a passion or interest in business journalism. The funds contribute to tuition costs as well as expenses associated with attending the SABEW conference. This award, sponsored by the Association of LGBTQ Journalists, is one of many scholarships offered by the association. This award honors Leroy F. Aarons, a prominent journalist who emphasized accurate and unbiased coverage of LGBTQ people and issues. Applicants for the award must submit work samples, including a new story/project crafted specifically for the award, based on a prompt in the application. Students must identify within the LGBTQ community. An award of up to $5,000 is awarded to one recipient, intended to cover tuition costs and fees.